, a celebrated mathematician, of French original, but who spent most of his life in England, was born at Vitri in Champagne May 26, 1667. His father was a surgeon, and spared no pains in his education, and sent him early to school, where he wrote a letter to his parents in 1673, a circumstance which filial affection made him often mention with great pleasure. 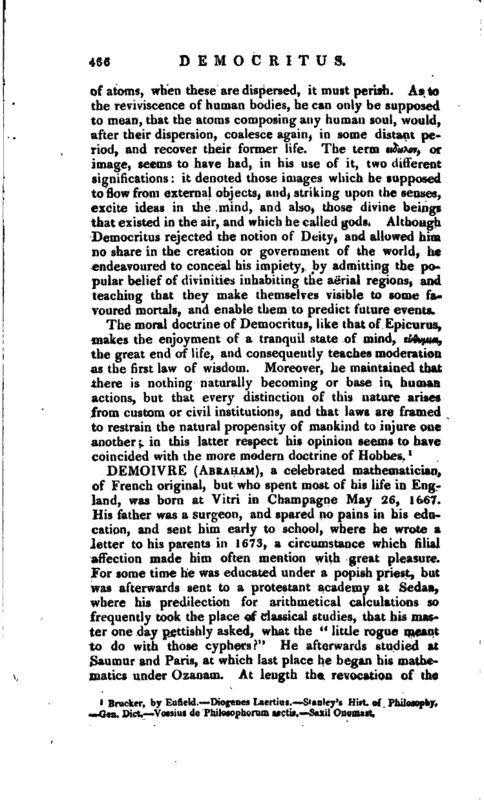 For some time he was educated under a popish priest, but was afterwards sent to a protestant academy at Sedan, where his predilection for arithmetical calculations so frequently took the place of classical studies, that his master one day pettishly asked, what the “little rogue meant to do with those cyphers?” He afterwards studied at Saumur and Paris, at which last place he began his mathematics under Ozanam. At length the revocation of the | edict of Nantz, in 1685, determined him, with many others, to take shelter in England; where he perfected his naathematical studies. 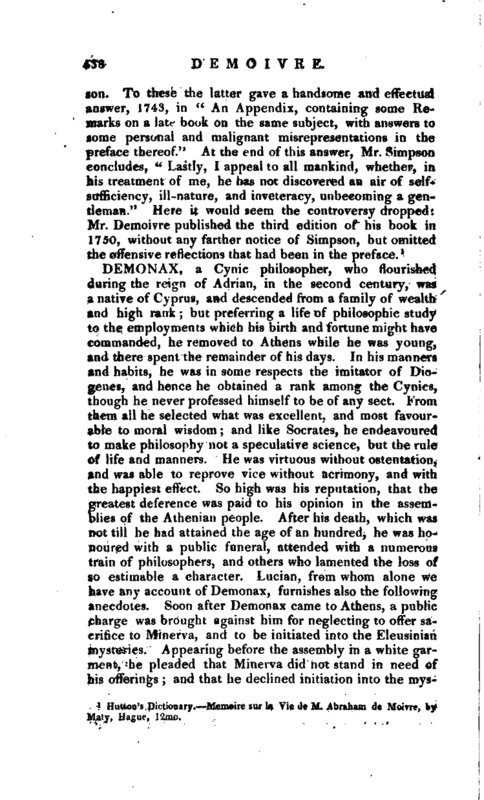 A mediocrity of fortune obliged him to employ his talent in this way in giving lessons, and reading public lectures, for his better support: in the latter part of his life too, he chiefly subsisted by giving answers to questions in chances, play, annuities, &c. and it is said many of these responses were delivered at a coffee-, house in St. Martin’s-lane, where he spent much of his time. 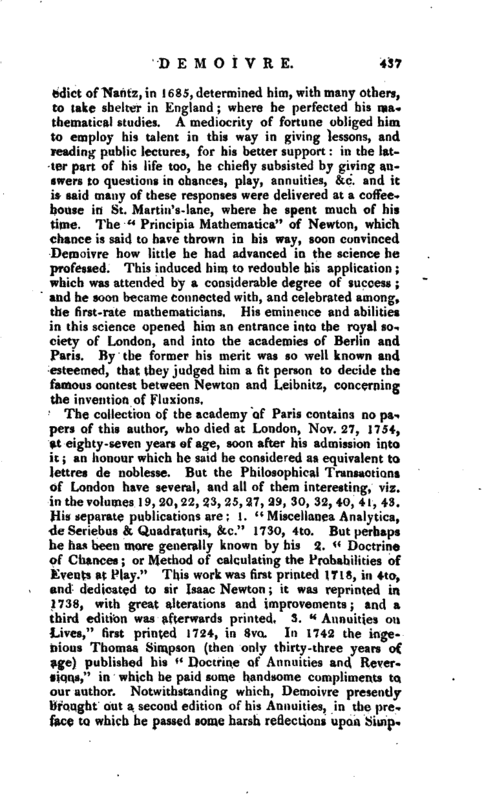 The “Principia Mathematica” of Newton, which chance is said to have thrown in his way, soon convinced Demoivre how little he had advanced in the science he professed. This induced him to redouble his application; which was attended by a considerable degree of success; and he soon became connected with, and celebrated among, the first-rate mathematicians. His eminence and abilities in this science opened him an entrance into the royal society of London, and into the academies of Berlin and Paris. By the former his merit was so well known and esteemed, that they judged him a fit person to decide the famous contest between Newton and Leibnitz, concerning the invention of Fluxions. Hutton’s pictionary. Memoire sur la Vie de M. Abraham de Moivre, by Maty, Hague, l2mo.